Dorothy Brown, no longer on the ballot in the Chicago mayoral race, has thrown her support behind Amara Enyia. 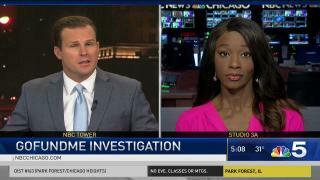 NBC 5's Mary Ann Ahern has the story. Long-time proven vote-getter Dorothy Brown passed the torch to Amara Enyia on Thursday, endorsing her in the race for Chicago mayor. Brown was removed from the ballot for not having enough signatures, and at least five other candidates spoke to her about winning her endorsement. "The woman that I believe will be the next mayor of the city of Chicago, Amara Enyia!" Brown declared to a room full of cheers. Reports have claimed for years that Brown has been under the microscope of a federal investigation, and though she was never charged, it brings questions to this endorsement. For her part, Enyia adds Brown to her list of supporters that already includes Chance the Rapper and Kanye West. "What Clerk Brown is doing is representing the right way to make sure that younger people are integrated and brought into the process," Enyia said. Brown would not be specific but questioned the integrity of Willie Wilson, who challenged Brown's petitions. She did not endorse him even though they share the same base of older, church-going voters. When asked Thursday if there were any promises of campaign donations in return for the endorsement, Enyia said "we didn't talk in those transactional terms." "This race is so important," she said, "it’s really about making sure that as we campaign together, that we are echoing each other, that the things that we talk about when we go out into these neighborhoods is the same and that we’re able to excite people to come out to vote." With a larger spotlight on Enyia, she was asked about losing her job as village manager in University Village. An email from one of the trustees in 2017 reads in part, "I do not have confidence in your leadership and decision-making skills," but Enyia's campaign said it was her decision to leave the job because the village was resistant to clean up its finances. In November, Chance the Rapper was the main draw for a fundraiser for Enyia at the Chop House. While insiders said more than $25,000 was spent on steaks, an open bar and the cost of the room -- all donated -- the only in-kind contribution listed was $2,200.